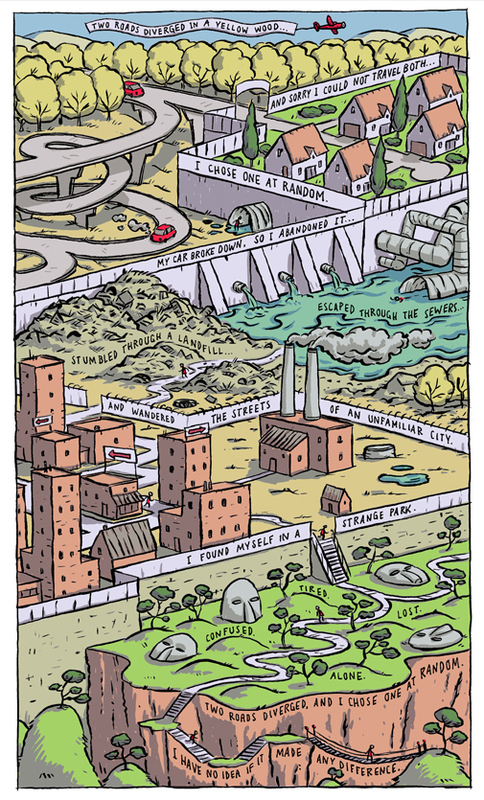 Email gsnider11@gmail.com if you'd like to order an 11"x17" poster of this comic (for $15 plus shipping). Really good. Creating something funny is way easier then creating something deep like this. Can we buy this as a poster? I think you'll like the film "the loneliness of the long distance runner"
Not only is it adorable and well drawn, but the message is so powerful. I'm sure you ignored my comment with good reason, but I'm very sincere in suggesting that film to you. I think your comic has a coincidental connection with that film about individuation and "the road taken." This is done very well. Found this on stumbleupon. great job! Very nice - my 11 year old totally got the Robert Frost! Well done all around - idea, composition, color. Happy to see someone understands the deeper meaning behind the frost poem. It isn't about being an individual; it's more about opportunity cost. you can't have your cake and eat it too. RS: way, way too long. I drew this one at a larger then usual scale, so I spent the better part of a day just searching for a large-format scanner. When I finally found one, I dropped my flash drive walking back to my car. Then I had to retrace my steps across the city, where I found it in the grass. It was a great example of life imitating art. This was awesome very deep I really enjoyed it. Thanks I will have to make sure and get the poster. Tiny Baby: I have an idea for the sequel. It's called "Stopping by the Woods on a Snowy Evening."